The story of Dunrobin Castle and its close links with the Earls and Dukes of Sutherland is set out in full in our feature page about it. There is also a separate feature page about the Dunrobin Castle Museum. 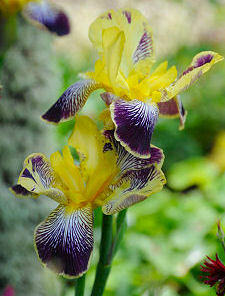 On this page we focus on the castle gardens and the falconry displays held there. Full information about opening hours and admission prices can be found via our Dunrobin Castle feature page. You approach Dunrobin Castle from the north through its extensive wooded estate and arrive in the parking area immediately to the north of the castle. The entrance hall is on two levels, and you access the gardens through a door on the eastern side of the upper level of the hall. 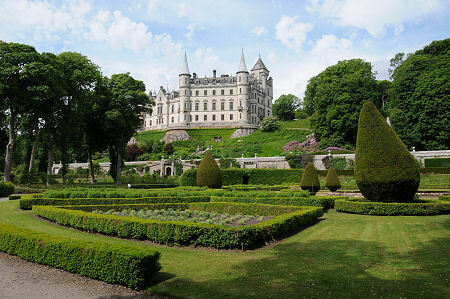 The gardens at Dunrobin Castle were laid out by the architect Sir Charles Barry in 1850. They were intended to complement the dramatic extension of the castle which was in its final stages of construction at the time and which, on completion, saw the previous building tripled in size. A building intended to look like a vast French chateau needed a suitable set of gardens to view from it, and from which it could be viewed to its best advantage, and Dunrobin offered the perfect location in the form of the flat ground between the base of the bluff on which the castle was built and the sea. The design of the gardens is fairly formal in overall layout, but very pleasant and human in scale when you explore them in detail. The overall design is best appreciated from the windows on the south side of the castle, or from the viewing terrace built specially for the purpose along the base of its southern side. The overall shape of the gardens is rectangular, and the rectangle is slightly offset to the north east of the central axis of the castle. The garden is divided in two. The north eastern half (or the left hand half as you view it from the castle) is home to a huge circular parterre or formal garden of very regular pattern with a powerful fountain in a pond at its centre. Beyond the parterre is the area used for falconry displays, while in one corner is the aviary. Off to one side of the garden, and accessed through a gate in the wall, is Dunrobin Castle Museum. The south western or right hand half of the garden is itself divided in two, either side of a grassy path that extends along a line from the centre of the castle. To the left of this path is a grove of tall trees. Beyond the trees is a croquet lawn and beyond that is an orchard. The right hand quarter of the garden returns to the formal theme and focuses on two ponds with fountains and a central pyramid garden, in which plants are trained up wooden pyramids. From the garden door in the side of the castle a short walk extends away into the woodland, beside which is a pet cemetery. The garden itself is accessed down a broad set of steps to the viewing terrace, then zig-zagging inclined paths and more steps which bring you to a lower terrace, and then into the garden itself. From a lower vantage point you begin to appreciate the height of the surrounding walls which help protect the garden from the elements. You also discover the raised borders and walkway within the walls along the northern side, closest to the castle, which are an outstanding feature of the garden. The Duchess Border at the eastern end is nothing short of magnificent. And at the western end you find previously unseen areas given over to meadow planting which when we visited were home to poppies of three distinct colours, red, pink and orange. Here, too are the garden's beehives. The balance between formality and informality has been carried out beautifully throughout the garden, and the repeated contrast between the two contributes greatly to the pleasure of a visit. Dunrobin Castle is home to superb falconry displays through the season, and these take place in an open area set aside in the south eastern corner of the garden, or the far left corner when viewed from the castle. 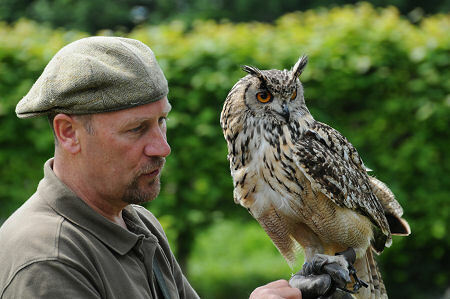 The displays are given by resident falconer Andy Hughes and they involve resident Scottish birds such as the golden eagle and the peregrine falcon as well as non-native birds such as the Chilean blue eagle and the European eagle owl. The history of falconry is an ancient one, and it began as a means of hunting, using the natural instincts of these magnificent birds to catch fast or difficult prey. Falconry still takes place as a means of placing food on the table in many parts of the world. Closer to home it has become a hugely skilled activity involving the patient training of magnificent and ferocious birds. The entertaining and fascinating displays which take place at Dunrobin Castle demonstrate both the skills involved on the part of the falconer and the magnificence of these creatures prepared to work in partnership with man. They also provide a highly unusual opportunity to see birds close up that are, at best, usually only glimpsed at a distance. Located within the grounds of Dunrobin Castle. See our Dunrobin Castle feature page for full visitor information.